Traditional styles remain popular for bathrooms, particularly in combination with more contemporary bathroom design features. If you're designing a bathroom in a period property, consider opting for some traditional features in addition to more modern pieces. We love the idea of pairing ornate pieces with a minimalist scheme or styling simple sanitaryware with botanical wallpapers inspired by traditional prints. Bridging the gap between old and new, our selection of traditional bathroom ideas will leave you feeling inspired. Designing a traditional bathroom from scratch? Be sure to check out our guide for more practical advice. In a space with stand out original features – a beautiful stained glass window for example – opt for a light and neutral scheme. It's an easy and effective way to make a bathroom feel bright and spacious, while ensuring that an incredible feature becomes a focal point. If you're blessed with a spacious bathroom, consider creating a traditional look with the addition of vertical wall panels. As well as adding the impression of height to a room, they enhance the country-cottage feel of the space. Check out more of these gorgeous wall panelling ideas for some inspiration. We love the use of sage green tones, particularly when combined with exposed wooden beams and styled with delicate house plants. Beautiful botanical wallpapers inspired by traditional prints and designs make a striking addition to a bathroom. Opt for something bright and bold if high ceilings and abundant natural light mean that your space won't feel overwhelmed, or choose a darker colour for a more dramatic impact – black bathrooms are having a moment. Patterned floor tiles have seen a surge in popularity over recent years – and for good reason. Now available in a variety of colours and patterns, they're a lovely option for hinting at a bathroom's history, while adding colour and personality. We have loads of patterned floor tile ideas over in our inspirational gallery. For a cohesive look that works well in small bathroom, we love the idea of opting for paintwork that draws out tones found in beautiful bathroom floor tiles – this sky blue door and door frame are a lovely example. For similar tiles, try Original Style. If your bathroom is blessed with striking original features – such as exposed wooden beams – consider opting for a neutral scheme that allows these stand out features to speak for themselves. A white freestanding bath in a traditional shape suits the style of this period property bathroom. Find similar at The Bath Store or check out this round up of our statement freestanding baths. Timeless pieces that make a real visual impact, freestanding baths are a popular addition to a traditional bathroom. To design a space with a unique feel, we love the idea of opting for a traditional shaped bath with a bold coloured finish – particularly if it draws out the more subtle tones of a beautiful botanical wallpaper. For inspiration for traditional freestanding baths, see our design gallery. For a similar bath, try Drummonds. While displaying photos or artwork isn't the norm in a bathroom, it can make a lovely addition to a traditional space. Pair a large work with a traditional freestanding bath to create a striking focal point. This unique, spray painted portrait adds a contemporary twist to an otherwise quite traditional space. While a grey scheme and matt black freestanding bath have a distinctly modern feel, traditional aspects can be successfully worked into a space with the addition of reclaimed furniture and the establishment of an original feature as a focus point. We love the stylish feel of this bathroom, with carefully stacked and styled logs tucked inside an original fireplace. If you want your traditional bathroom to have a chic and timeless feel, consider opting for a grey scheme – this can be enhanced with the addition of French-inspired panelling. Pair with white sanitaryware and bathroom accessories for a soothing space. We love the addition of this Hampton Wall Light from Original BTC for a classic feeling traditional bathroom. For more tips on how to light your bathroom, check out our guide. If your bathroom has high ceilings and abundant natural light, consider opting for a darker, more moody scheme – something that works particularly well if your room has gothic features. Style with large ornate mirrors and a standout gallery wall. If you love this dark and atmospheric look, we have load more inspiring ideas in our black bathrooms gallery. Find this Haze Freestanding Bath at Waters Baths of Ashbourne. To complete the look of your traditional bathroom, pick bathroom furniture accordingly. Think a gently curved vanity unit painted in a classic, neutral colour. This serene traditional bathroom has been kitted out with Freestanding 134 Curved Vanity Unit with doors in Classic Grey and Minerva white worktop with integrated white basin, £2,629, Burlington Bathrooms. There is nothing quite like the amazing quality and shiny appearance of a real copper bath. As if the stunning look weren't enough, there are other benefits to choosing a copper tub. Firstly, they are virtually indescructible, and will last you a lifetime. Secondly, they require almost no cleaning, since they are mould- and bacteria-resistant. The Aequs Bath is from William Holland. We can't think of a traditional bathroom this colour scheme wouldn't work with. Fine and mellow, and with more depth to it than white, beige is an easy way to create a smart, formal bathroom. This gorgeous traditional bathroom has been painted in Rolling Fog by LIttle Greene. Wall panelling is a lovely period feature to be cherished in any room; in the bathroom, it can be especially valuable, adding design interest to an otherwise plain room. Make the most of wall panelling, if you have it, by painting it a contrasting shade to the rest of the wall. A large mirror – or a mirror of any kind – will make a small bathroom feel larger and brighter. Simple. But choosing something with impact for a period-style bathroom is a balancing act: you don't want the mirror frame to be too bulky, or it will take up too much space, visually at least; too small and it will lack punch. So, opting for a wall of mirrors is a good compromise, and choosing antiqued mirror glass is perfect – creating character and charm while reflecting light. Add a touch of exoticism – and take a neutral colour scheme to the next level – with a large artwork. To protect it from moisture, get a glass frame. Find out more about how to display photos, pictures and artwork to effect in our guide. This bathroom looks wonderfully lived in thanks to elements borrowed from living room and bedroom design, including book storage and a wardrobe. This is also a clever way to utilise space in large bathrooms. Chequered tiles instantly smarten up a room – but there's a way to take this design hack even further, by choosing a bold colour rather than monochrome. 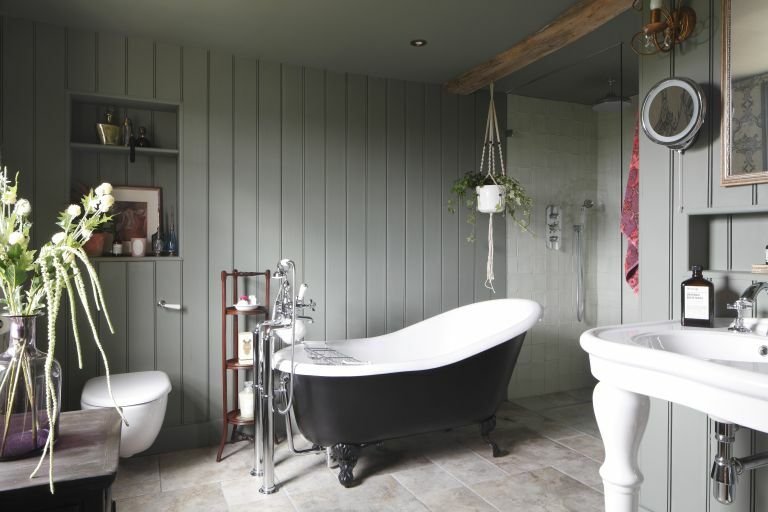 A green colour scheme that matches the painted floorboards to the tub makes this bathroom really stand out. Use our guide to painting floorboards to create this effect on a pine floor. Or, discover how to pick the right size tiles for a small bathroom. Room dividers and screens are very helpful in bathrooms that are shared by couples – and they're a great way to add texture and pattern. Canvas will work best in the bathroom – avoid paper screens. This bathroom features curtains made from Sanderson fabric.